Wholesale grocer with premises in Market Street and Church Street for 42 years. First elected to the Local Board in 1863 and later to the Urban District Council representing South East Ward. He was appointed as a Magistrate in 1907. He served on the Local Authority for 25 years. He was an advocate of electric lighting long before other Councillors took much interest and appointed Chairman of the Electricity Committee when it was formed, supervising all the initial work. Unfortunately he left the Council before the undertaking was begun. He also was an advocate of the provision of a Free Library for the town and although not on the Council he made an appeal for the funding to Andrew Carnegie on behalf of his fellow townsmen. His letter was sent at the same time as the one from the Clerk to the Council. Wesleyan Methodist - he was an eloquent preacher. 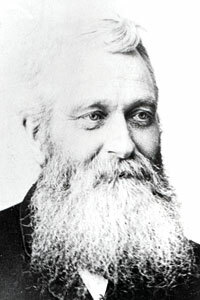 He was also associated with Holland's School for more than 40 years, latterly as Superintendent, but also as a teacher and Missionary Society Treasurer. His last appearance in a public capacity was on the occasion of King Edward VII's funeral when joined the Civic procession held at Farnworth. Thomas Stanley said of him that having sat upon the Council with Mr Foster when it was first formed he could "testify to his kindness and consideration, to his zeal for the public good and to his power to attack anything that was not good or right. He tried to leave the town and its people better than he had found them."